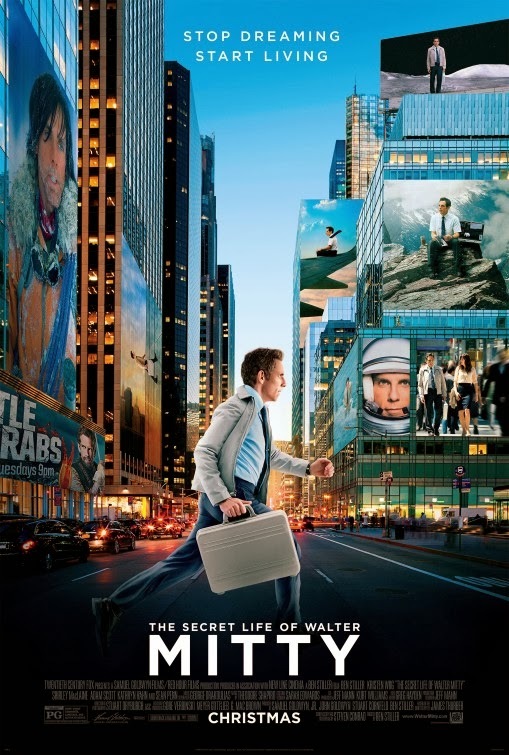 The story idea of “The Secret Life of Walter Mitty” is a natural for movies. A quiet man leads a rich internal life compared to the mundane existence he eeks out every day. Back in 1947, the great Danny Kaye starred in a Goldwyn musical feature based on the story. There is two hours of entertainment that is fairly conventional and has a nostalgic charm to it that seems light and airy. This new take on the story is a lot more serious, it has a great contemporary song score (but it is not a musical), and despite having some darker themes, it is even more ephemeral than the Danny Kaye film. Ben Stiller stars in and directed this mediation on loneliness and fantasy. In this story, Walter is not really unfulfilled in his job, but he is wistful over lost opportunities and the absence of love in his life. It is his longing for romantic contact that drives him to live out a series of imaginary adventures that are then followed up with more real experiences. His interest of affection is not a glamorous music star or model, but rather a pretty co-worker, near his age with a pre-teen child. Walter’s main fantasy is not unreachable but all of the scenerios in which he sees himself or later actually experience, are far out of his ability to achieve. My daughter used the phrase “magical realism”, which is often associated with the literary works of Gabriel Garcia Marquez. I know the concept has been used to describe films as well. “Chocolt”, “Amelie” and even “Groundhog Day” are examples. The most recent example of a film of this type would be “The Curious Case of Benjamin Button”. That film is deliberately referenced in this film, probably as a way of easing us into accepting that which is not logical but which makes the story more interesting and memorable. The film moves quietly for the most part. It is punctuated with the kind of soft lyrical music you would find on an independent radio station or on NPR at night. The music sets the tone for the film, it is sometimes contemplative, sometimes exuberant but it is always controlled and tasteful. The movie story is the same way. there are bursts of visual craziness but they are simple passages in a longer,calmer plot line. As Walter moves from imagined adventures to real one, we begin to allow the outrageous concept of an everyday man doing the incredible, repeatedly, to be the norm. I think the music score has as much to do with this as the “magical realism” motif that the film adopts. If it were not for the presence of some spectacular visual sequences, which combine location work with CGI fx, this is a movie that could have been done on a shoestring budget. As it is, this is a big time studio picture directed at a holiday audience with an intention to have very broad appeal. From a story and performance point of view I think they largely succeed. Walter Mitty is an identifiable character and the woman he longs for, played by Kristen Wiig, seems a nice normal match for a romantic comedy. The fact that this is not a traditional romcom is what makes it appealing but it may also make it a target. I can imagine a world full of cynics, sharpening their knives to go after this lightweight entertainment. If you listen to them, believing the film is tired or not challenging, you will miss a nice experience at the movies. Not every film needs to achieve histrionic heights to be worthwhile. This is a pleasant fantasy that has a few humorous moments and some beautiful imagery. The central performers are appealing and the story is told effectively. I think it might be a little long for such a souffle. Adults will be able to indulge the leisurely pace of the film, but younger audiences used to instant gratification and comic book action will probably notice the running time a little more than they should. The film has a few things to say but for the most part it just tries to show us how much life we can experience, if we just find sufficient motivation.